The dyed sea shell disc slides up and around the hook and you can change it to match your outfit. Perfect for travelling. You get 3 pairs of discs with each order - add a note to tell me your favourites. I have a number of options available. So give me the full list. Choose this in sterling or argentium sterling, 12 kt gold filled or rose gold filled, or allergy safe niobium or titanium - in natural grey or a range of colours. For titanium please add a note regarding colour choice. 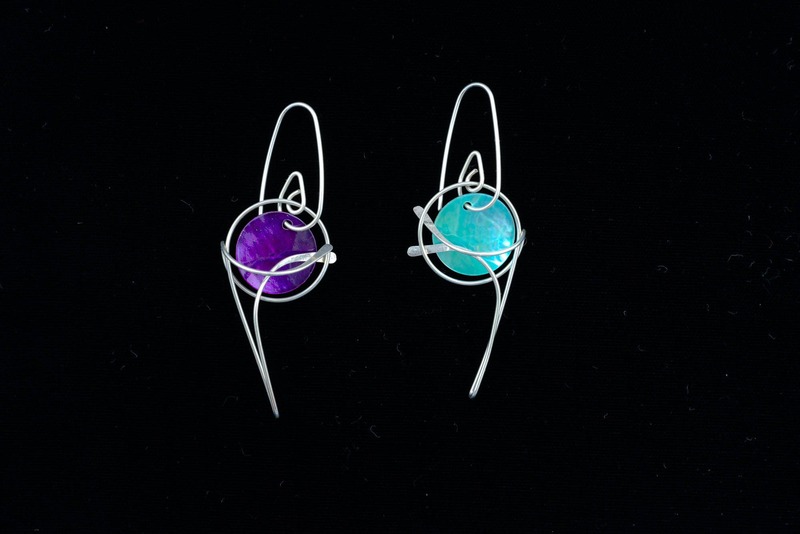 These earrings are elegant and are sure to bring many compliments. Measuring about 4 cm long, not including the hook. The discs for these are about 15mm in diameter. You may also order a small version for the same price - just add a note to your order on size requirement. If you want them a little bigger that is fine as well. These are an original design and concept which I have been making for 30 years now! I create them all by hand using improvised tools. There is no soldering. I use 20 guage wire for the earrings and the hooks. Some areas are cold forged for design emphasis.